Turmeric is a spice used in curry. Curcumin, the active component in turmeric that provides health benefits, REALLY provides health benefits. Its anti-inflammatory properties match that of some anti-inflammatory drugs! It boosts your body’s antioxidant capacity, and this can be protective against a number of conditions, including cancer. Turmeric is linked to improved brain function, increased memory, and a lower risk of brain diseases (possibly even Alzheimer’s). This super spice may reduce your risk for heart disease. Because of its anti-inflammatory properties, it can be helpful with arthritis and joint aches and pains. There is early evidence from scientific studies that turmeric/curcumin products and supplements, both oral and topical, may provide therapeutic benefits for skin health. It’s great for gut health and helps repair leaky gut. Make my turmeric ‘fried’ chicken! Avocado is a serious super food. It’s nutrient dense, which means you get a lot of nutritional benefits from them for little in the way of calories. Avocados are also a good source of vitamins, minerals and antioxidant nutrients. Cooking with avocado oil is something I recommend because it has a higher smoke point, meaning it’s safe for cooking at high temperatures (whereas olive oil is not, FYI). It also has a very neutral taste, unlike olive oil, so it’s more versatile in my opinion. That’s why I use it to make my mayo. 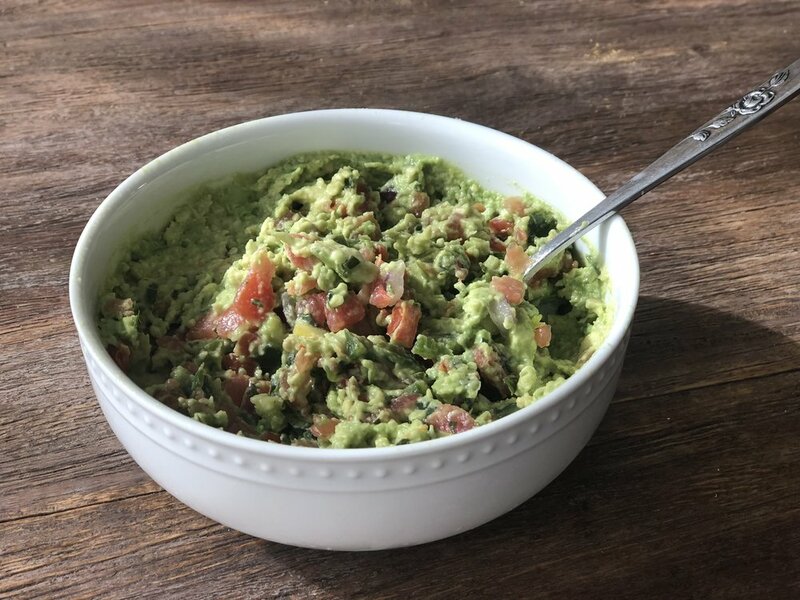 Because avocados are so good for you, guacamole can be a great addition to your healthy diet, if you do it right of course. JCBN Guacamole fits that bill, and it only has 2 ingredients! I love Brussels sprouts. Seriously love them. If they are on a menu, that’s what I order. So of course, I make them myself too. My version is stripped down, and still delicious. Not to mention easy! I had to add another photo. This is the turmeric roasted version. How gorgeous are they!? I made these in a pinch when I needed an emergency snack that still was up to nutritional snuff. You can use any combination of your favorite nuts and seeds. This batch included what I had on hand, almonds and pumpkin seeds. Almonds are full of healthy fats, and contain fiber, protein, and magnesium (among other nutrients). Pumpkin seeds are high in antioxidants, magnesium and fiber, and have anti-fungal properties! Stir as they brown for a few minutes, it goes fast so stay on top on it! You can snack on these, and even add them to salads. Recipe alert! I call this da boom chicken (don't ask). Disclaimer: In addition to the creation of dangerous compounds from the fat/oil used, frying meat can lead to the formation of AGEs, which can cause oxidative stress and inflammation (linked to all sorts of chronic disease). Using a lower cooking temp (did these on medium), and adding acid (lemon juice) can help reduce AGEs formation. So... enjoy, take cautionary measures, and don't eat this daily. When I was a kid, my favorite snack was mayo on Wonder Bread. Fast forward MANY years, I still love mayo. Just not the junk that comes along with store bought brands. Put the egg, and any of the add ins into your blender or food processor. Turn on the machine to let the egg and other ingredients mix, and garlic chop up if applicable. Drizzle the oil in while the machine is running. This is the make it or break it step, you may want to watch a YouTube video to observe the technique (highly recommended). FYI, it took me more than a few iterations to get it down. I love mayo but not the junk that's in store bought versions. So I make my own, here's how! Use it as you would any mayonnaise! I use it most often as a salad dressing or dip when the add ins are included. Bananas are a good source of fiber and dopamine (the feel good brain chemical). They are a powerhouse of nutrients including potassium, calcium, manganese, magnesium, iron, folate, and vitamins B2 and B6. If you are avoiding bananas for any reason (blood sugar, allergies/sensitivities, candida/yeast overgrowth, etc.) you can substitute cooked yams, sweet potatoes, or butternut squash. Eggs are a complete protein (they contain all the essential amino acids). They contain antioxidant nutrients (vitamins A and E, lutein and zeaxanthin), choline (good for your brain), vitamin D (bones, mood, brain), B vitamins (B12 and folate), selenium (mineral important for antioxidant enzymes and thyroid hormone production), and iron (helps your red blood cells oxygenate your tissues). Many foods can trigger symptoms, whether you have skin issues, GI disturbances, or any wide variety of health conditions. Dairy and nuts are major triggers for many people. When we can't tolerate certain foods, we miss out on flavorful sauces in particular because they are often full of stuff we can't eat. Enter my diary and nut free pesto recipe! *Note: The pesto becomes more flavorful left to sit (in the fridge) overnight. Use a vegetable spiralizer to make ‘noodles’ out of the zucchini. Drain moisture. Add your favorite protein to turn this salad into a meal!